Happy 2015, dear readers! We hope one of your New Year resolutions was to keep eating good food because that’s definitely what we plan to do. One distinct advantage of living in Los Angeles is its proximity to ethnic cuisines from around the world. Here on the Westside, we’re just a stone’s throw away from Little Persia – the stretch of Westwood Boulevard that is affectionately known as Tehrangeles for its prominent Iranian immigrant population. Waking up with an inexplicable craving for crispy rice one lazy afternoon, we decided to get lunch at Farsi Cafe. The first thing I noticed when we walked inside the dining room was that it was set up to primarily accommodate large parties; the two of us settled in at a table meant for four. Throughout our lunch, we understood why — there were families of all sizes coming in through the door to share a leisurely meal. 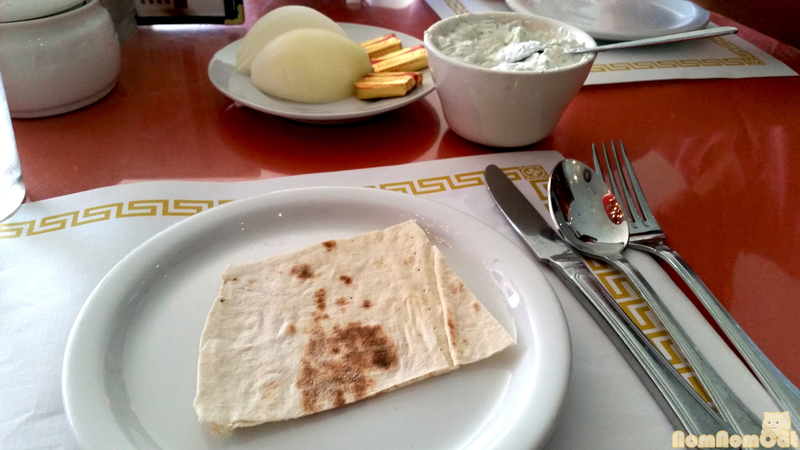 Our server brought out a basket of flat bread (lavash) along with the traditional plate of butter and raw onion. (We were perplexed but a quick Google search taught us that the onion is meant to accompany the grilled meats and the butter could be either spread on lavash or melted over rice). He also surprised us with a bowl of mast-o khiar (yogurt and cucumber) compliments of the chef. Similar to Greek tzatziki or Indian raita, this cool refreshing dip was the perfect accompaniment to both the plain flat bread and to the spiced grilled meat I ordered for my entree. 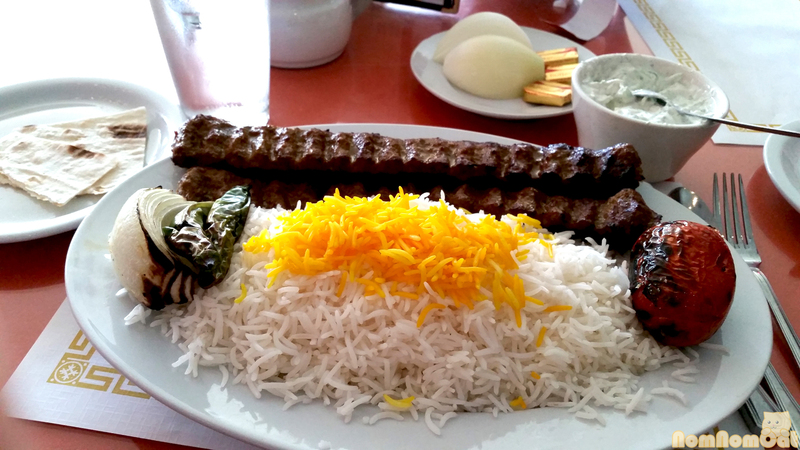 Speaking of entrees, I selected my usual Persian food go-to — the koobideh (ground beef kabob) with rice. The generous portion came with two skewers and a giant mound of rice topped with a smaller pile of saffron infused rice (my favorite!). The typical garnishes of grilled onion, tomato, and bell pepper added that extra smoky charred flavor. The beef was well seasoned, and did I mention how huge the serving was? I got three meals out of it! Our journey to Farsi Cafe started with the desire for crispy rice so of course, Martin went with the house special tahchin. Each order is served a “slice” of a large “pie” made of crisped saffron rice and shreds of chicken. The slice is then topped with zereshk (barberries), tart little dried currants that pair excellently with chicken (think turkey and cranberry). I stole more than a few bites of his meal and just could not stop myself. It was so good — the crunchy rice, the spiced chicken, the tart berries! 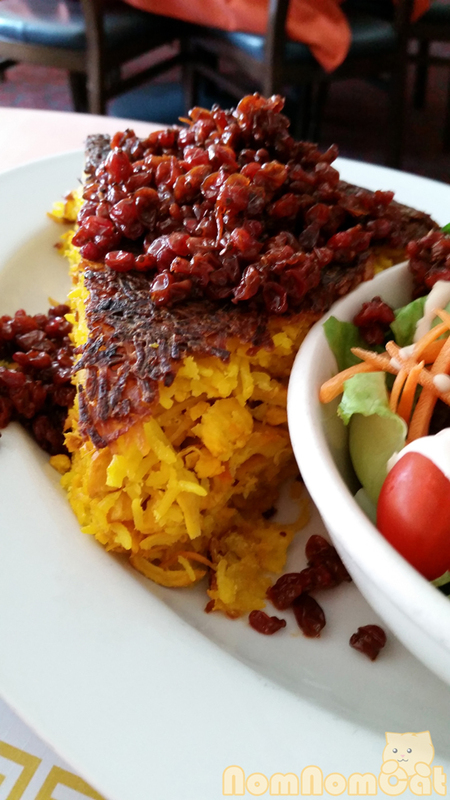 If you’re trying to choose from the many delicious offerings all along Westwood Boulevard, we suggest coming in to Farsi Cafe to try their tahchin, mast-o khiar, saffron rice, and koobideh. And then wash it all down with Persian ice cream at Saffron & Rose just up the street afterward!